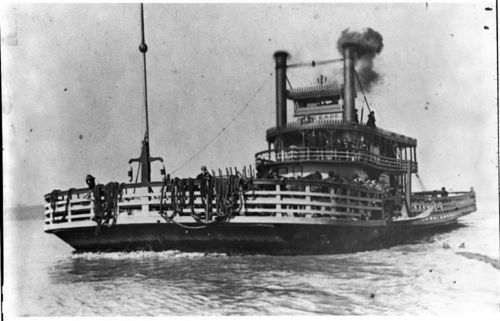 This is a photo of the "Annie Cade" steamboat on the Missouri River. It was berthed at Kansas City, Missouri, and plied the river between Kansas City and Harlem, Missouri. Captain William A. Cade was the owner. The steamboat is a symbol on the Kansas flag. This image can be used to discuss symbolism and the importance of transportaion in opening up Kansas for settlement.